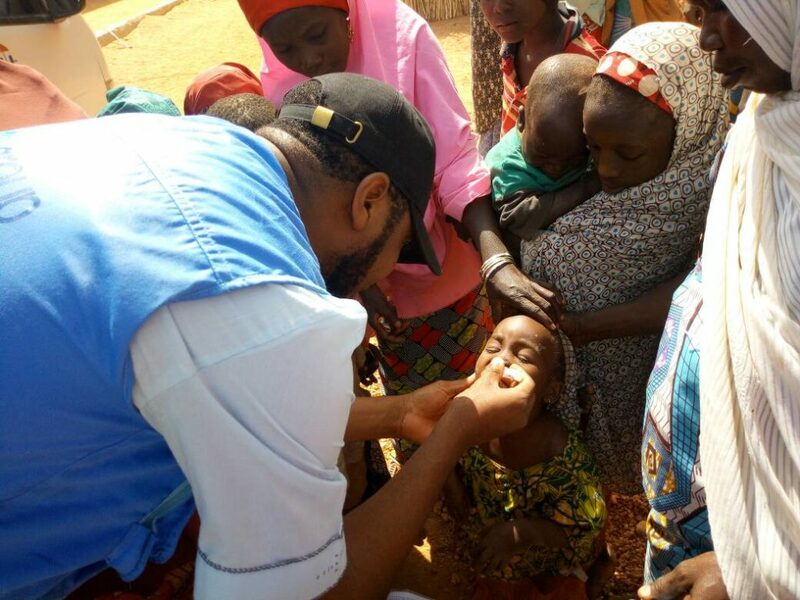 In Northern Nigeria, a region often associated with its long-running battle against the terrorist organization Boko Haram, International Medical Corps is training and mobilizing entire communities—traditional birth attendants, barbers and religious leaders—as part of a mission to eradicate polio. Nigeria was removed from the list of polio-endemic countries in 2015, an accomplishment that International Medical Corps and other organizations had worked tirelessly to achieve. As a member of the CORE Group Polio Partnership Project (CGPP), International Medical Corps began its polio programming in Kano State in March 2015, expanding efforts to Borno State six months later. However, the virus was rediscovered in September 2016 in Borno—where it is believed to have been circulating undetected for years. The discovery, which was a major blow to the campaign, illustrates the difficulties associated with eradicating the persistent virus. It’s a project that has proven to be a marathon—not a sprint. In 1988—despite the introduction of an effective vaccine decades earlier—350,000 wild cases of poliovirus were still recorded around the world, paralyzing an average of 1,000 children every day. In response, the World Health Assembly established the Global Polio Eradication Initiative (GPEI). The campaign—unprecedented in scope—has since vaccinated 2.5 billion children and cases have dropped by 99.9%, with only 31 reported in 2018. According to one estimate, this effort has saved 13 million people from paralysis. The cornerstone of polio eradication is the polio vaccine, an affordable and safe way of immunizing the group in most danger of contracting the virus: children under the age of five. If it wasn’t for the vaccine, we wouldn’t have witnessed this dramatic drop in incidence and polio would not be well on its way to eradication, a feat modern medicine has managed to achieve only with smallpox, in 1980. In northern Nigeria, International Medical Corps is working to defeat the virus amid a widespread humanitarian crisis in areas where the terrorist organization Boko Haram regularly carries out deadly attacks. The latest case of wild poliovirus was recorded in Kano State, an area plagued by security challenges. Operating amid severe security concerns, the team on the ground in Nigeria is also tasked with debunking persistent myths about the vaccination program that are due to a general lack of trust in the system. Some community members believe that vaccinations infect children with the disease or that the vaccine is a family planning effort in disguise, says Dr. Billy Joseph Kubenga Tshishiku, International Medical Corps Program Director in Nigeria. To debunk the myths associated with immunization among local communities, the International Medical Corps team trains and mobilizes key community members. The training centers around social mobilisation—teaching volunteers to successfully communicate key messages to local populations that encourage them to participate in immunization activities. These messages are shared through groups, as well as through one-on-one discussions, where volunteers also answer questions and address concerns. A key element of International Medical Corps’ polio eradication program involves working with traditional and religious leaders. Without their understanding, acceptance and support of the project, the chances of success would be slim. Even their detachment from a project can affect results, says Shehu Ibrahim Ramat, International Medical Corps CGPP Program Coordinator in Nigeria. As the most trusted members within their communities, they are the gatekeepers to local populations. If they approve of the immunization, people will participate. In addition to working with religious leaders, International Medical Corps’ team also attends naming ceremonies, referring new mothers and their babies for immunization. Utilizing other key community members—such as traditional birth attendants, who can use their networks to identify children—has also proved vital in the battle against the virus. Other challenges remain, many of which relate to the movement of people displaced by the conflict. And going forward, it will be critical to ensure that affected populations continue to immunize their children, even when Nigeria is declared polio-free. But thanks to International Medical Corps and other CORE-group partners, the West African country has now been free from wild polio for 30 months—leaving only six more months until it, and the entire African continent, are free from polio.